If you’ve been shopping for an engagement ring but haven’t found anything to your liking then you should consider building an engagement ring. Don’t worry. It doesn’t require any heavy lifting or tools. Building an engagement ring simply involves choosing each component of your ring as opposed to buying a ring directly from the case. When you’re done with this article you’ll be ready to start building an engagement ring. The first step in building an engagement ring is choosing a setting. 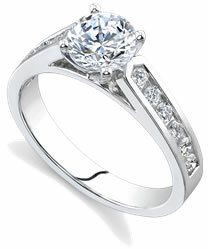 Your desired setting determines what kind of diamonds and stones will work with the ring. Traditionalist will probably favor a classic setting like the prong. Adventurers may go with something less traditional like the bezel. Prong – The prong setting has four or six hooks which support one main center stone. The center stone takes front and center with this setting. It is elevated by the supporting hooks and appears to float above the band. The prongs can be shaped to support various sized stones. If you are interested in building an engagement ring that is a solitaire then this is your best option. Channel – this setting places the stones in a row on the band’s surface. Stones appear to be a part of the band, instead of suspended above it. If you’re building an engagement ring composed of princess cut diamonds, this setting will be beneficial. Bezel – Building an engagement ring with this setting requires the main stone be set within a rim, and not on prongs. However, with this setting, the metal rim surrounding the stone is visible. It extends slightly above the stone it protects. Pave – this setting consists of a cluster of stones encrusted into the band’s surface. Tiny prongs secure the stones and are barely noticeable. This is a great setting for building an engagement ring with a lot of small stones. Once you’ve found an acceptable setting, it’s time to choose the stone or stones. When building an engagement ring, the setting you pick determines your stones. If you like the prong setting then you can only pick one stone. Other settings allow for more diamonds, side stones, etc… Diamonds come in various shapes, sizes, weights, and colors. When making this decision, consider your setting and budget. Flawless stones and diamonds cost considerably more than those with flaws. Considering that some flaws are only visible under a microscope, you could choose a cheaper, somewhat flawed ring, save money and still create a beautiful piece of jewelry. Some online jewelers, including Novori.com, offer a ring building option. Choose your setting, decide if you want white or yellow gold, palladium or platinum, pick your diamond, then mix and match to see what you find appealing. It is a useful tool for building an engagement ring that allows you to view a variety of combinations.